Sometimes I just need chocolate. Hot chocolate. No. Not the kind you drink. It’s way too hot for that (it’s 80º today!). I need spicy chocolate. I need heat. 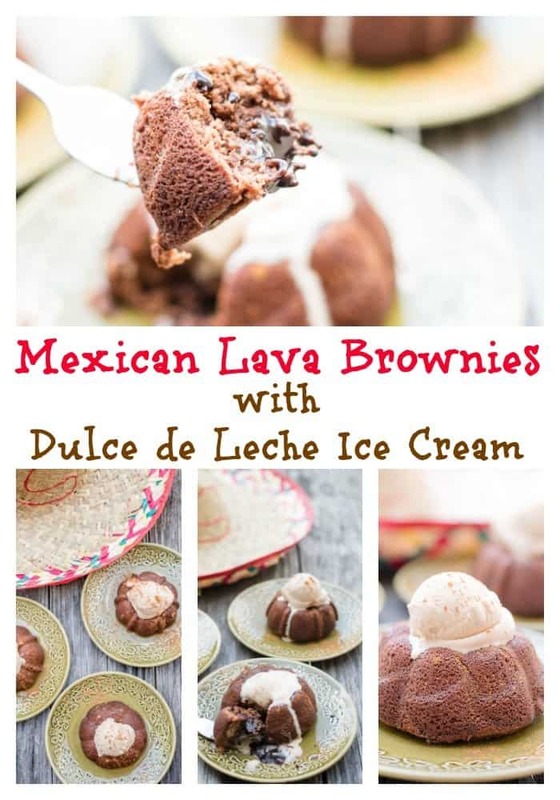 Sometimes I just need Mexican Lava Brownies & Dulce de Leche Ice Cream (caramel ice cream). Coffee ice cream is also good with these brownies. The hubs and I have been to Mexico several times over the years and we always search for the most authentic, non-touristy places to eat. Oh, and we’ve found some good ones. Once we were in a tiny restaurant and I ordered guacamole. The owner sent his young son across the street for avocados. Talking about fresh! 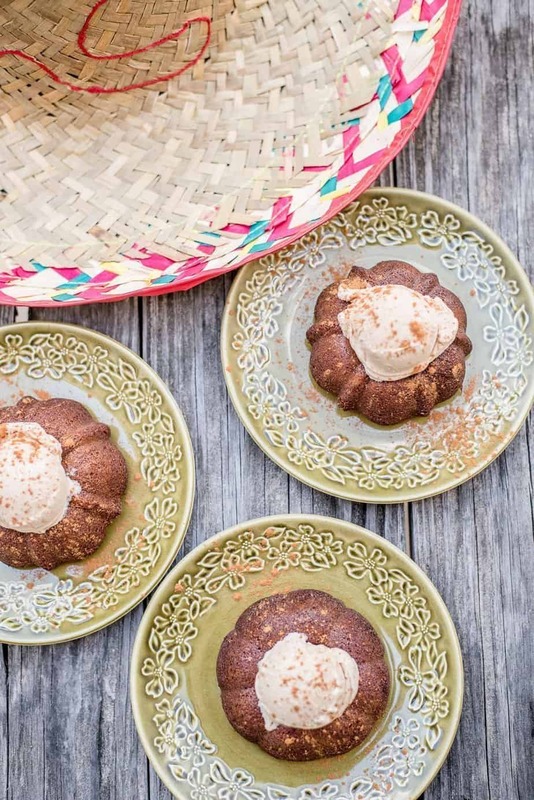 Mexican Lava Brownies are so easy to make. Don’t tell anyone, but I use a brownie mix. There’s no shame in my game! I also add a pinch of cayenne pepper and cinnamon to kick things up a notch. If you don’t like the heat, get out of the kitchen. I mean, leave the cayenne pepper out completely. It’s all good. But it’s better with the pepper. As soon as you dig into my Mexican Brownies, the chocolate center begins to ooze out and mixes with the caramel ice cream. 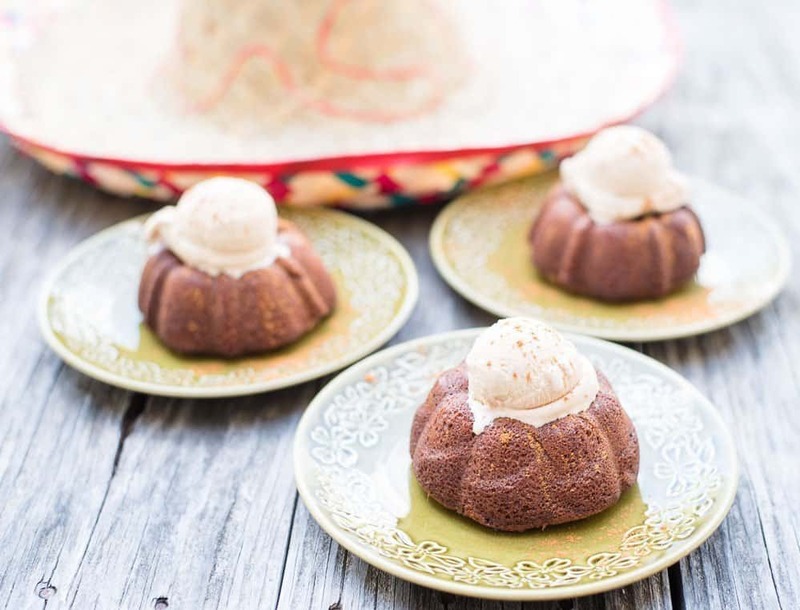 It’ll make you want to do a Mexican hat dance. Heat oven to 400º. Grease 12 muffin cups. Meanwhile, melt chocolate chips and butter in the microwave for 45 seconds. Stir until smooth. Set aside. Whisk together the eggs and egg yolks until frothy. (I do it all by hand). Gradually add brownie mix, cinnamon, vanilla extract and cayenne pepper and stir until combined. Stir the melted chocolate/butter mixture into the brownie mix. Bake for 10-12 minutes or until sides are set. The center will be moist. Cool for 2 minutes and run knife around the edges of the muffin cups. Turn brownies onto a baking sheet to cool. Serve with ice cream. I ate the whole thing! Someone has to test taste, right? Any volunteers? Looking for more scrumptious Mexican recipes? 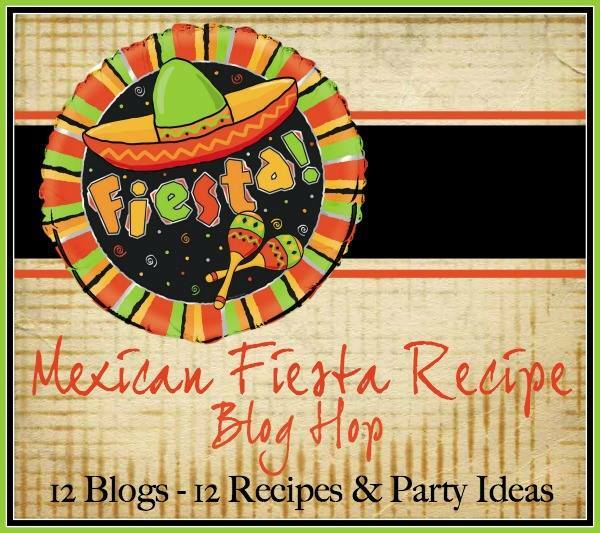 Be sure and visit all the bloggers participating in the Mexican Fiesta Recipe Blog Hop. Cinco de Mayo is right around the corner. What’s your very favorite Mexican food? I love it all. You certainly cannot get much more fresh than having the avocado fresh from the store! This recipe sounds scrumptious and looks fabulous! I make lava cakes from scratch all of the time! I can’t wait to try this spiced up version. Mexican foods is a fav or ours, too, and I regularly do something Mexican one day a week for dinner. This dessert looks amazing and hot out of the oven with dulce de leche ice cream is sure to be a hit here. And of course, there no shame in the game for a brownie mix and a little cayenne pepper. The brownies with the ice cream looks really tasty. I would love to have this for dessert. I love Mexican chocolate with the chile and the cinnamon. These sound awesome and I love how simple it is since you start with a box mix. I love that you use a brownie mix! That’s my kind of cooking! These sound amazing though to be honest you had me at “chocolate”. Ooooh, this makes me want to lick the screen! I love that you use a mix, because that means I can easily substitute a gluten free mix. Yay! I could definitely go for one of those brownies right about now. Yum! That hint of spice sounds really good. I love brownies and this brownie recipe sounds amazingly delicious! Brownies are my husband’s fave dessert, so this is definitely a recipe I can’t wait to try! Goodness, these look delish! I’m gonna try to make them gluten-free! 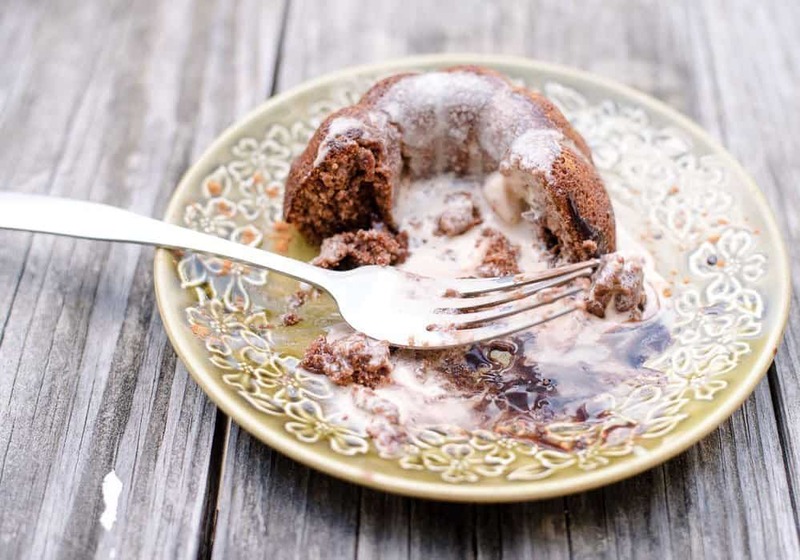 I love lava cake so this is right up my alley. A center filled brownie would be perfect right now. These brownies look amazing! I never realized that there such a thing as a Mexican brownie like this. This is a must make. It’s beautiful and looks delish. My guys are thanking you in advance. Thanks so much for sharing. I’m worried about the spice but I understand it is part of the process. Mexican food is an absolute favorite in my home as well. How can I say no to brownies. It only has a tiny little kick of spice, but you could leave it out all together. My family loves these brownies. Nothing goes together better than brownies and ice cream! I love personal sized desserts they are just too cute! Yummo – We love Mexican too but I don’t like it too spicy or hot for me. My family does though. Yes I think coffee ice cream would be good. Of course I think coffee – anything. This looks super delish, thanks for a yummy recipe I can make and the name lava being in it? Just makes me want to make it all that much more! Brownies are one of my favorite baked goods! 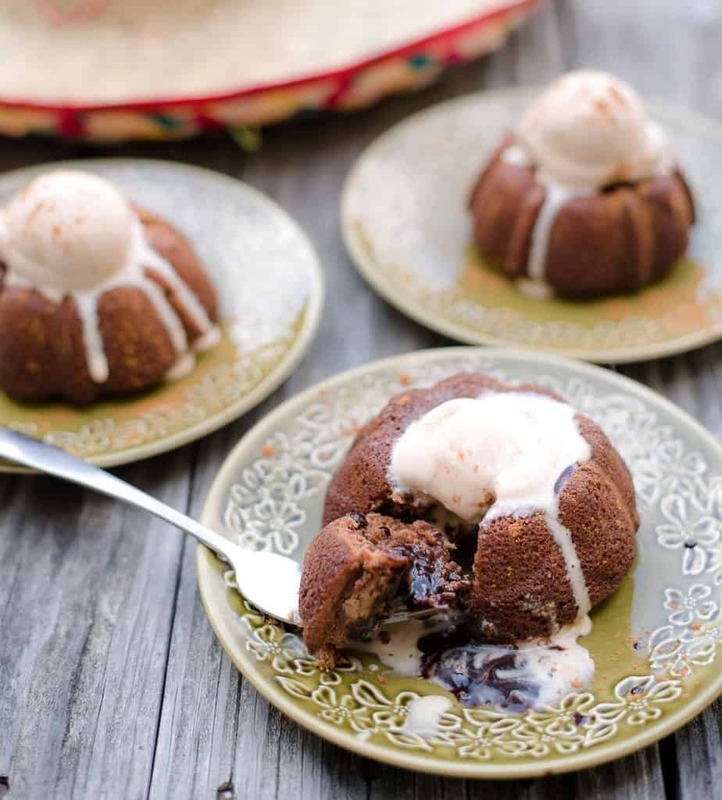 I have not had lava cake in ages so I think I’m going to make these tonight! Pinned! If I could pin this a million times, I would – it looks amazing! Do you have a special muffin pan? How did you get them to look like little bundt cakes? It doesnt need to be Cinco De Mayo to have a fiesta! I would love to try this and it looks so cute! Yummm… It looks so delicious!! I can’t wait to try this recipe, Thanks for sharing!! Oh, my goodness! I almost have nothing else to say – except YUM-EEEE! !